USA has been a party to the Hague Apostille Convention of October 5, 1961 (as a member) since 1980 but it started issuing apostilles for public documents on/after October 15, 1981. 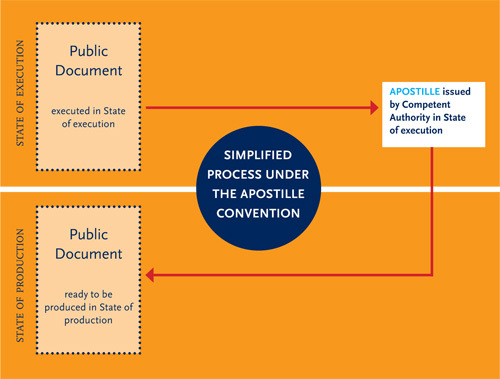 The diagram to the right shows how apostille system greatly simplifies public document circulation and acceptance between countries that are parties to the Convention. The Competent Authorities in the USA who can issue apostilles are based on a 3-tier system. Below table shows examples of how this 3-level system works in the USA. Please note that both countries (of document issue and document use) need to be party to the Convention whether as a member or as a non-member. In this case your public document should be accepted by the country of use with just an apostille from one of the Competent Authorities above. If your public document was issued or is to be used in a country where the Apostille Convention does not apply, then the chain legalization process must be followed. There may be initial certification requirements dependindg on the country and agency who issued the document or the type of document but the 2 most important completion steps usually occur in Washington, DC with the authentication by the US Department of State and finally the legalization by the foreign embassy/consulate. Canada Legalization Services can assist you with all of your documents needs. You can use the links in the "Document Services in the USA" block for specific service type that we can arrange in the USA by our sister company called "WDC Apostille & Legalization Services". Alternatively, you can contact us if you have any questions about the Hague Convention or request a quote for a specific document situation.